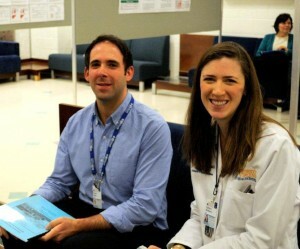 Infectious Diseases clinical fellows Vince Covelli and Kate McManus. Welcome! 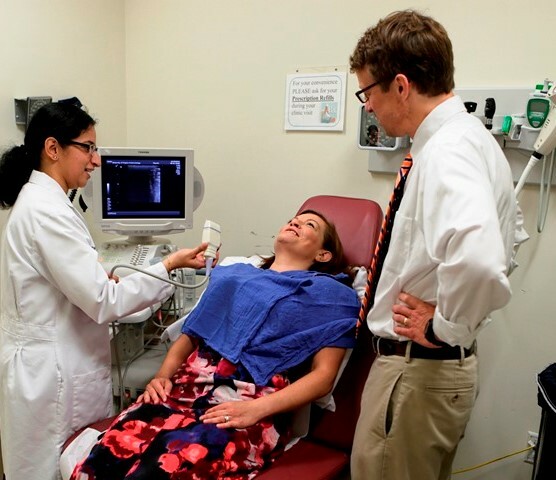 Fellowship programs at UVA’s Department of Medicine offer an array of subspecialty clinical and postdoc training opportunities. Approximately 100 fellows are enrolled in eleven subspecialty and seven advanced subspecialty programs, which are accredited by the ACGME or by the subspecialty’s own governing body. We invite you to explore our fellowship programs through the links below. Each site contains program-specific information about application procedures, clinical training, and research and training grant opportunities. Feel free to contact the program director or fellowship coordinator with your questions. Endocrinology fellow Ramya Embar Srinivasan examines patient with faculty member and Endocrinology fellowship director Chris McCartney.